Byrd is about one year old, so he's still got a ton of kitten energy. He can get a little carried away, so he'd probably do best in a home without small children. He's neutered, micro-chipped, current on his vaccinations and negative for FIV and FeLV. If you're looking for an infusion of love and fun in your life, this is the mancat for you. Come meet Byrd at PAWS today! 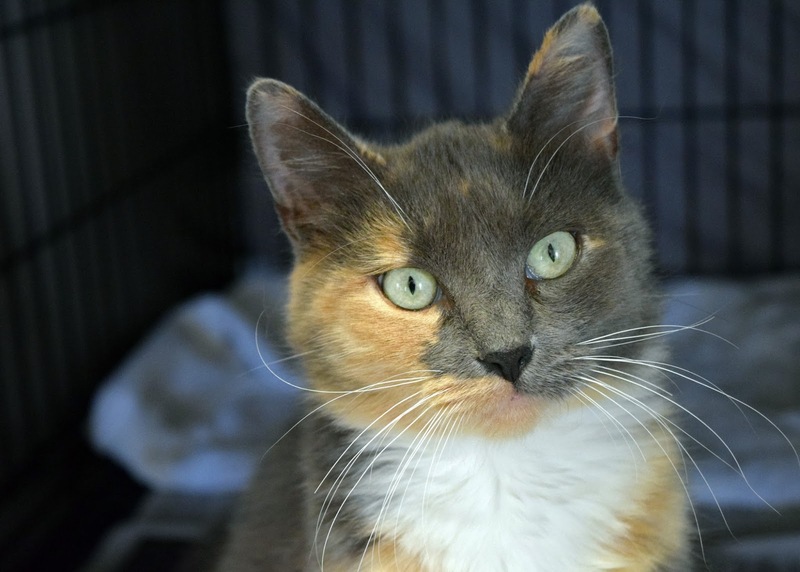 Our new friend Snickers isn't just another pretty face (and some beautiful furs). 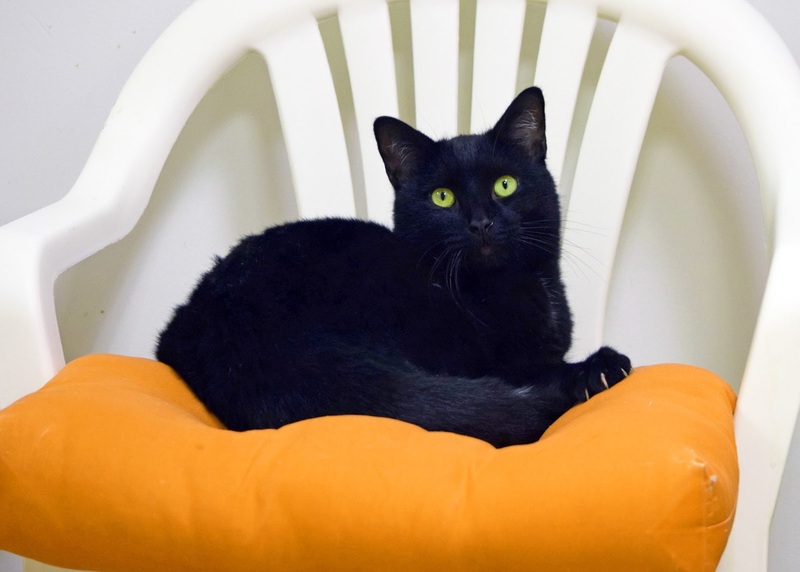 She also happens to have a super sweet and gentle personality that would make her a wonderful best friend for whoever is lucky enough to adopt her. How's this for a selfie? 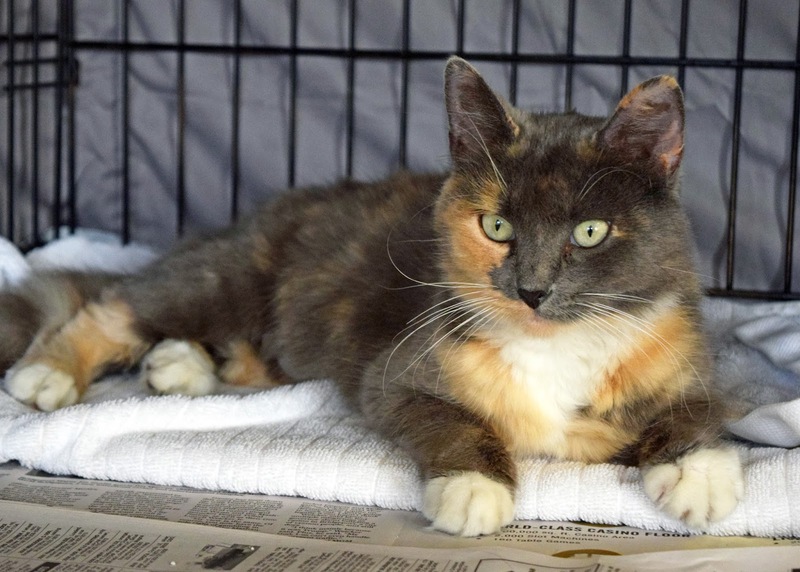 Two year-old Snickers is spayed, micro-chipped, current on her vaccinations, and negative for FIV and FeLV. 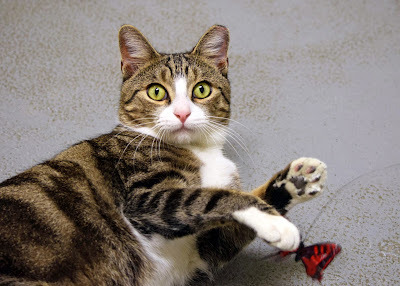 She loves being pet, and spending time with her human friends at PAWS. 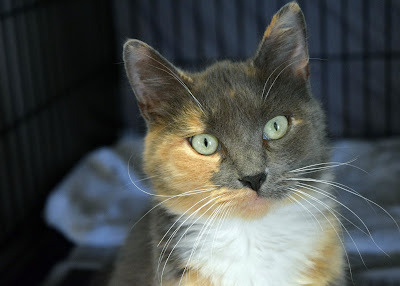 She is really, really friendly, and ready to find her forever home. Won't you please give this wonderful kitty the chance she needs? We have so much for which to be grateful. 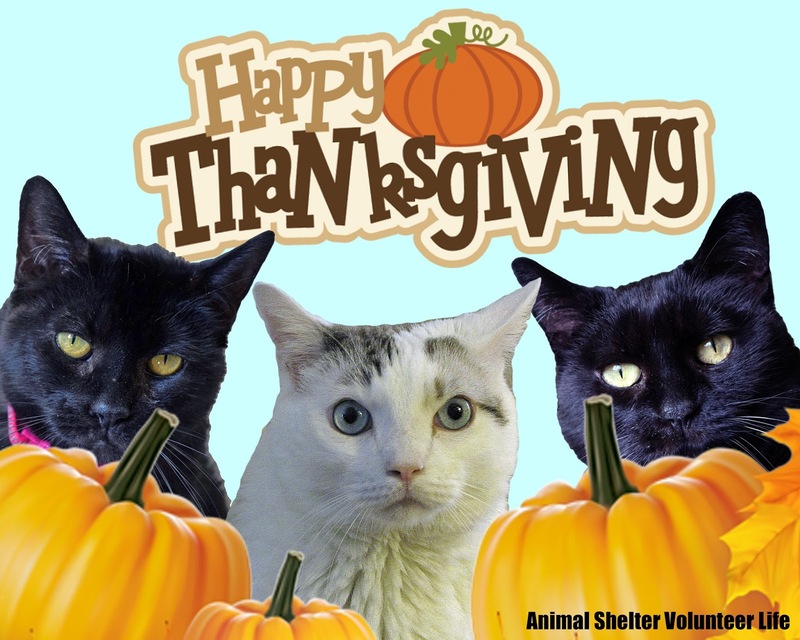 We are thankful for the special people who adopt shelter animals and/or take in homeless pets, for those who help animals in need, donate time and resources, serve as fosters, care for feral cats, and/or participate in trap-neuter-return programs. We're thankful for wonderful and amazing friends both near and around the world. Thank you for sharing your animals and lives with us, for your love and support, and for sharing in our joys (and our sorrows when stories have less than happy endings). There are, of course, so many other things in our lives for which we are grateful. 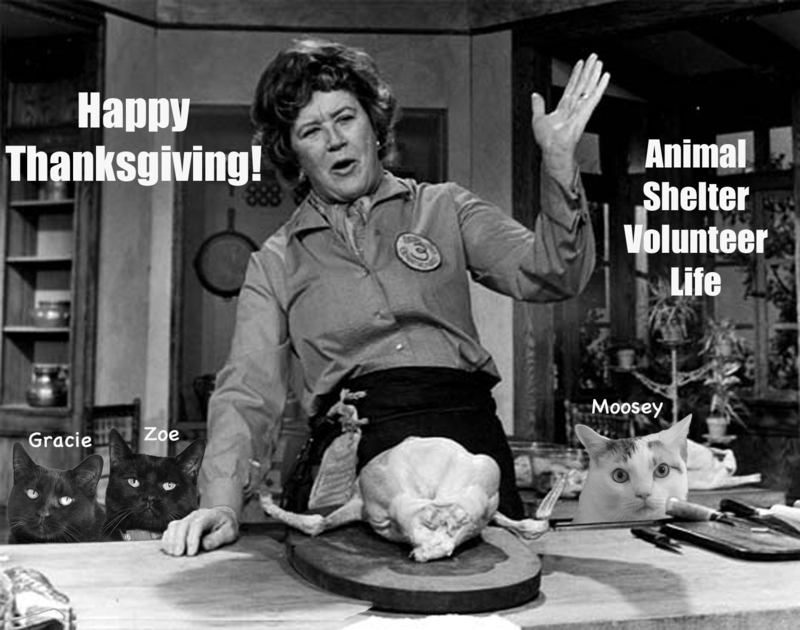 But because we love animals so much, the things we listed above are high on our list. Thank you all. 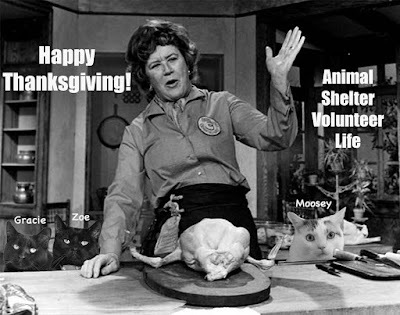 And for everyone who celebrates Thanksgiving ... we hope yours is happy. 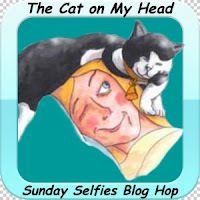 It's Sunday, and as is the case almost every week, we're taking part in the Sunday Selfies Blog Hop, hosted by our dear pals at the Cat On My Head. When we asked the PAWS cats who'd like to represent this week, up stepped spunky and beautiful Oreo. Oreo has the coolest markings. Her fancy tuxedo is one of a kind! Oreo is about 2 1/2 years old. She likes humans, and gets along with other nice cats. She's friendly and playful (she loves the mouse on a string toy and the laser), but she is also good at letting you know when she's had enough. 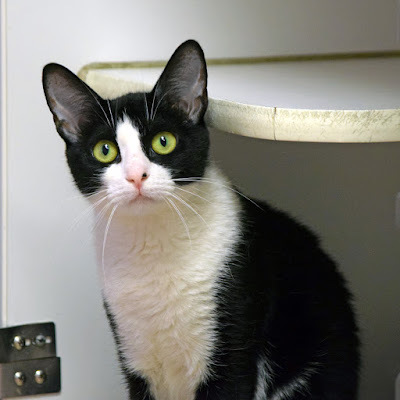 Oreo is spayed, micro-chipped, current on her vaccinations, and negative for FIV and FeLV. 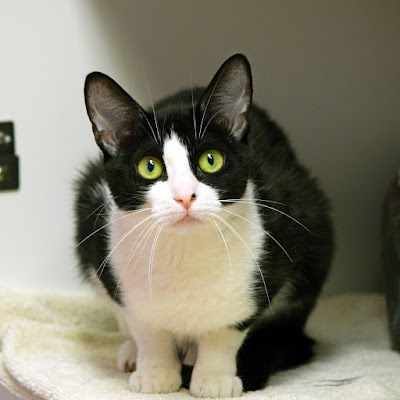 Oreo is so ready to find her happily ever after. Is it with you? It's the stunning one herself, Cathy Keisha! You're probably wondering how we ended up with a genuine selfie of CK. 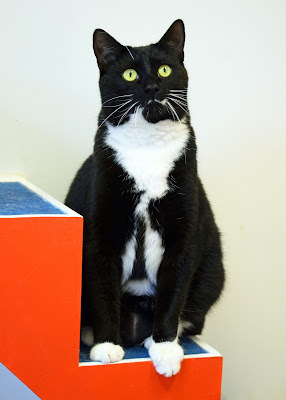 As it turns out, she, TW and Pop had a whole bunch of awesome stuff to donate to the PAWS cats ... scratchers, track balls, valerian toys, a water fountain, collars, toys, a catnip toy marinater, litter boxes, PTUs and more! So Tracey and I took a drive down the interstate for a visit and to pick up all the goodies. We had a great time, even if CK did hiss and throw a major asthma attack when she first saw us (sorry for surprising you like that, pal). In all seriousness, THANK YOU for your kind donations, which we know will be well-used and well-loved by the cats waiting at PAWS for their forever homes. You, TW and Pop rock! This is our handsome and gentle buddy, Van Zant. He's such a good (and good-natured) boy. And just look at that adorable face! Van Zant is only about 1 1/2 years old. 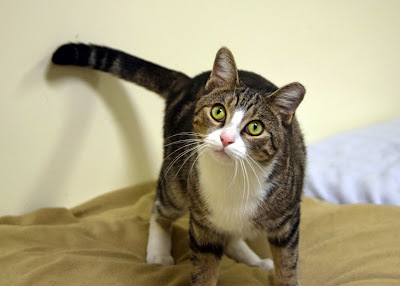 He's super friendly and gets along with other nice cats. He's also curious and playful, and loves getting pets and snuggles. And with the colder months now upon us, what could be better than snuggles from a soft, warm kitty? Van Zant is neutered, micro-chipped, current on his vaccinations and negative for FIV and FeLV. 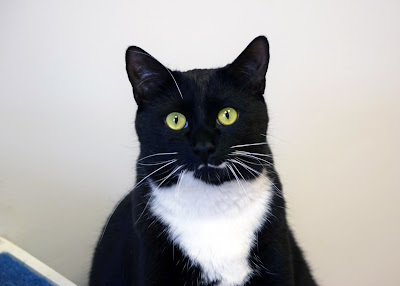 He's waiting at PAWS to find his happily ever after. Come meet Van Zant today! 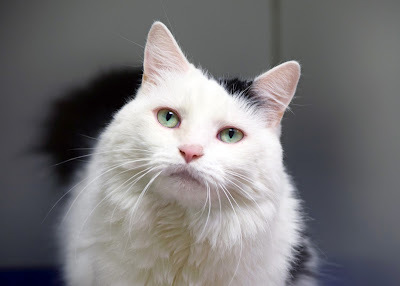 Cece is about 7 years old, spayed, micro-chipped and current on her vaccinations. 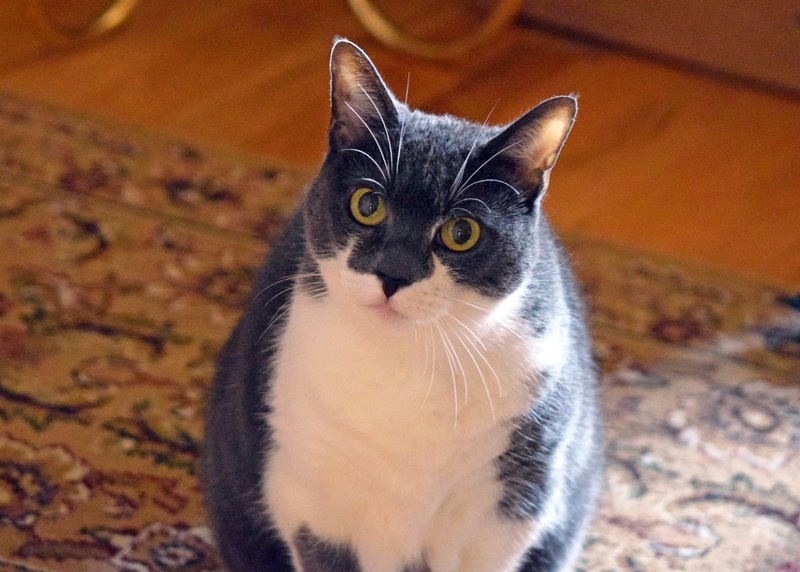 She has tested negative for FIV and FeLV. 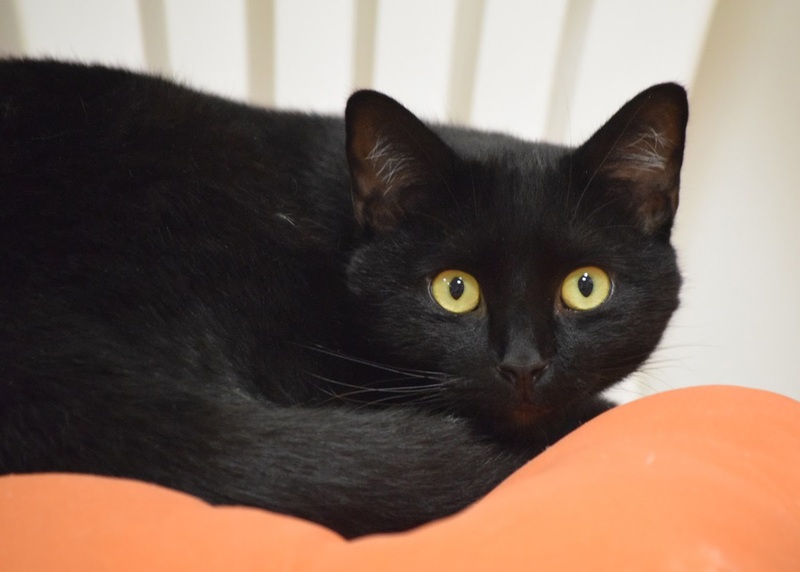 Cece's wonderful purr-sonality is more and more evident with each passing day, and we know she'll positively blossom in a forever home. Come and meet her today! 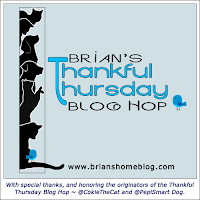 We're taking part in the Sunday Selfies Blog Hop, hosted by our pals at The Cat on My Head. Be sure to check out who else is hopping this week, and if you're so inclined ... join in on the fun! 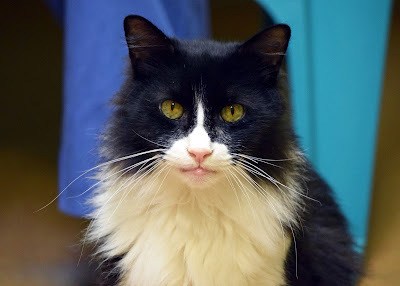 Our adoptable pal Sylvester is more than just a super handsome face. He's also got enough purrsonality to fill a room (and your heart)! 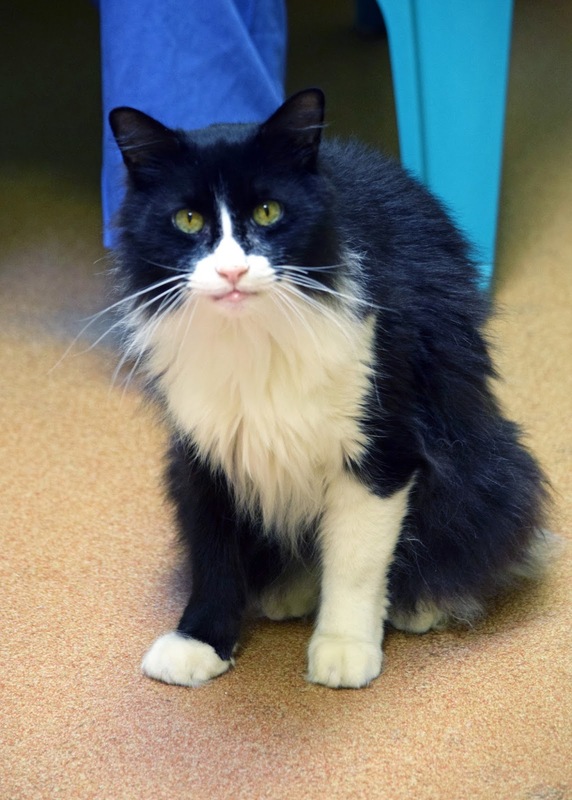 Sylvester is neutered, micro-chipped, current on his vaccinations and negative for FIV and FeLV. He loves being pet, hanging out with his friends, and making conversation (he can be quite a talkative dude when the mood strikes). At 11 years old, he's what some humans might call "mature." But you shouldn't let his age prevent you from finding your new best friend ... Sylvester qualifies for the PAWS Senior Pension Plan, which includes: no adoption fee, an annual wellness exam, vaccinations and blood work analysis for free for the rest of his life. Sylvester is seriously awesome. Come meet him today, and fall in love! Today, we’re taking part in “BlogBlast for Peace.” Since Mimi Lenox started it in 2006, this day of peace has grown to include thousands of bloggers in 214 countries and counting, all blogging about one thing ... PEACE. 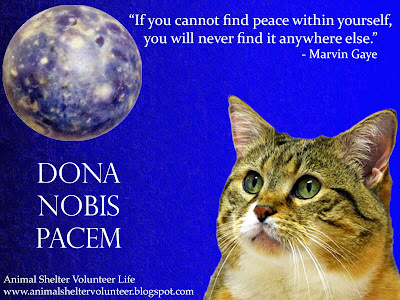 The official Blog Blast for Peace theme this year is "Finding Peace in Overwhelming Times." In a world where tumult and discord often take center stage, there's so much to be said for finding the kind of inner peace that grows and engenders peace, love and understanding. 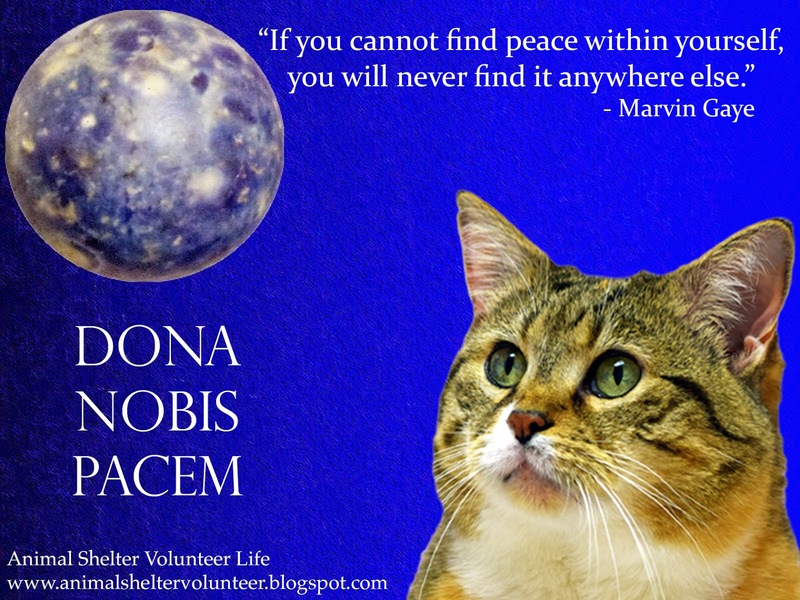 That's why we chose to feature our gorgeous and adoptable friend, Bella, on our peace globe. 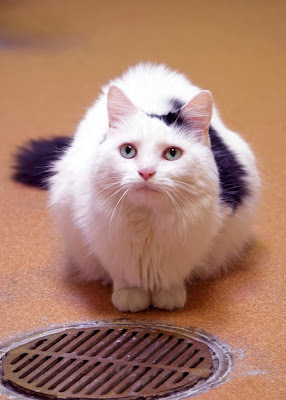 For a long time, Bella wasn't sure she could trust the people or cats at PAWS. 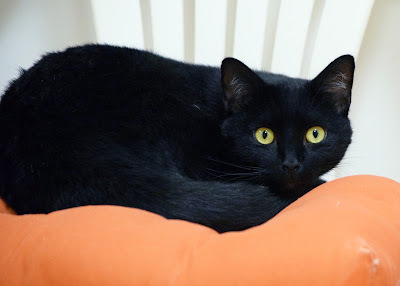 But with love and care, and her own "suite," she's become a completely different cat, one who is confident and full of the peace that comes with being happy with where she is at. She loves spending time with her favorite volunteers, enjoys being pet, and is even up for some occasional lap time when the mood strikes. 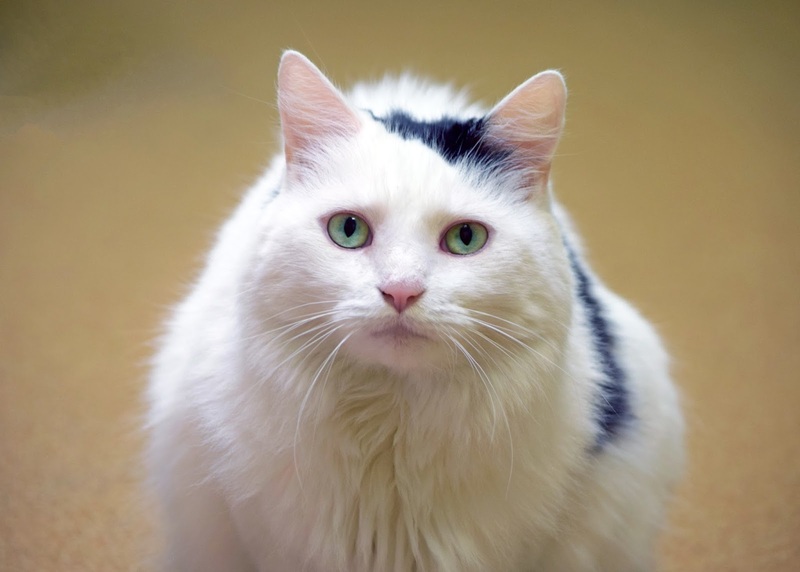 With the transformation that inner peace has brought her, Bella is supremely ready to find her own forever family. She’s still a little cautious with new people and situations, so she would do best in a quiet home with folks who will be patient as she adjusts to her new surroundings. Won’t you please consider giving Bella the home she deserves? 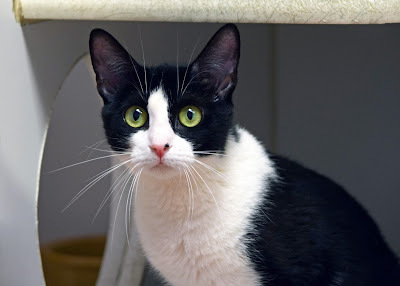 Our pal Minnie is sweet, playful and ready to find her happily ever after. Just look at her awesome whiskers. Her pink nose with the little beauty mark. And those big round eyes! Is she not precious and adorable? 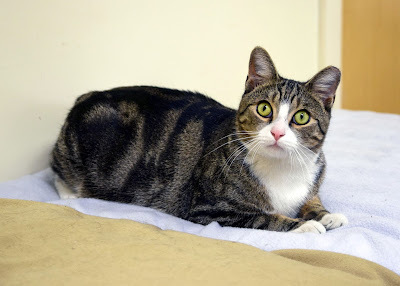 Minnie is about 2 years old, spayed, micro-chipped and current on her vaccinations. She is negative for FIV and FeLV. She's still getting used to life at PAWS, and as such, is a little shy around people she doesn't know. 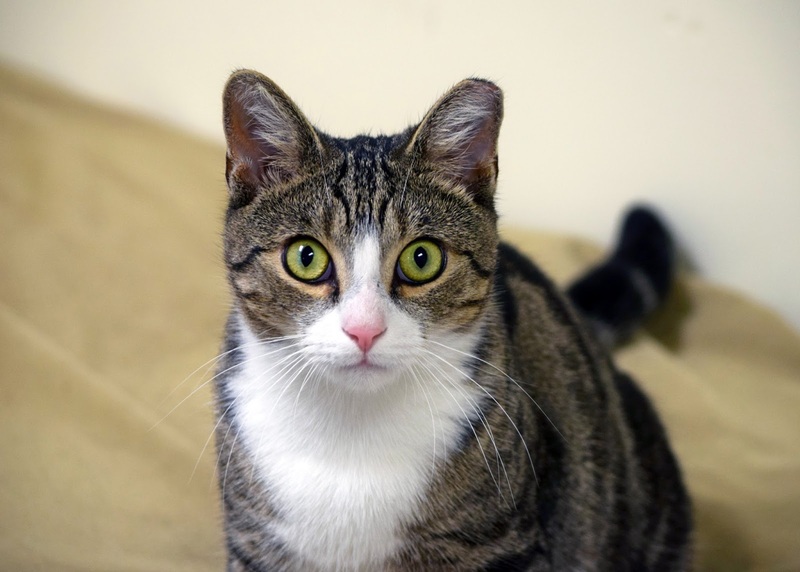 But we can tell that this cutie will positively blossom in a forever home. All Minnie needs is a chance. Is it with you?